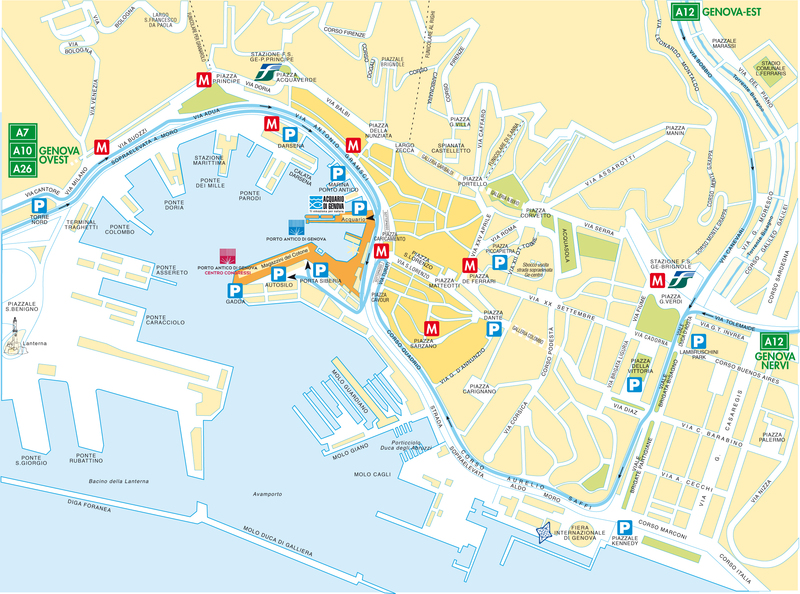 How to reach Porto Antico - Genova: map and direction by public and private transport. Porto Antico is the area of historical city center overlooking the sea, easily accessible by public and private transport. 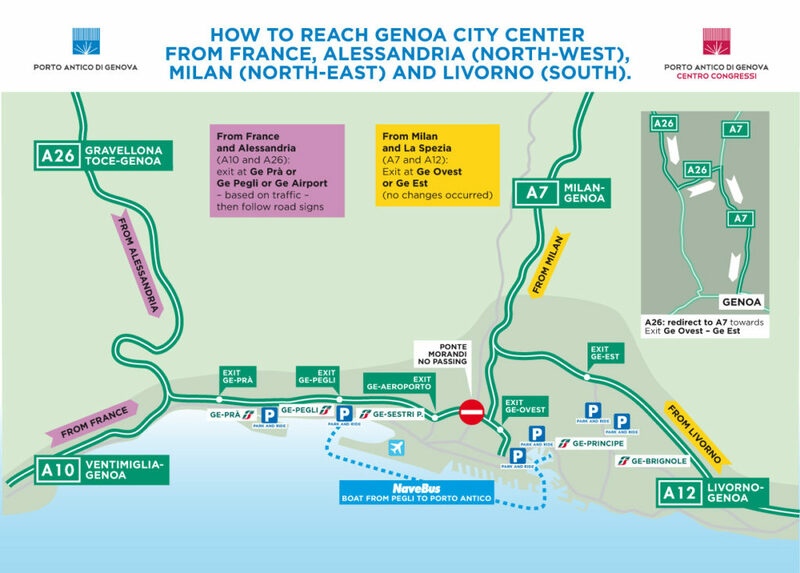 For those coming from the highway A12 we suggest going out at Genova Ovest exit or Genova Est exit and continue following the directions for the Porto Antico Area. For those arriving in Genova with the highway A7 (from Milan) we suggest going out at Genova Ovest exit and take the “Sopraelevata” direction. Exit at the first exit, continue past the Porto Antico pedestrian entrance and turn right at 2nd intersection to access Porto Antico located next to Guardia di Finanza building, directions to parking area. drive along the highway A26 to Novi Ligure, take the link road to the highway A7 and continue to the Genova Ovest exit. Alternatively in not particularly busy days: take the highway A26 and exit at Genova Prà or Genova Pegli or Genova Aeroporto, then follow the signs for urban roads. For those arriving from Ventimiglia/France via highway A10 we suggest going out at Genova Prà exit or Genova Pegli exit or Genova Airport exit. From there follow the signs to reach the city center and the area of Porto Antico. Click on the map below to download it. 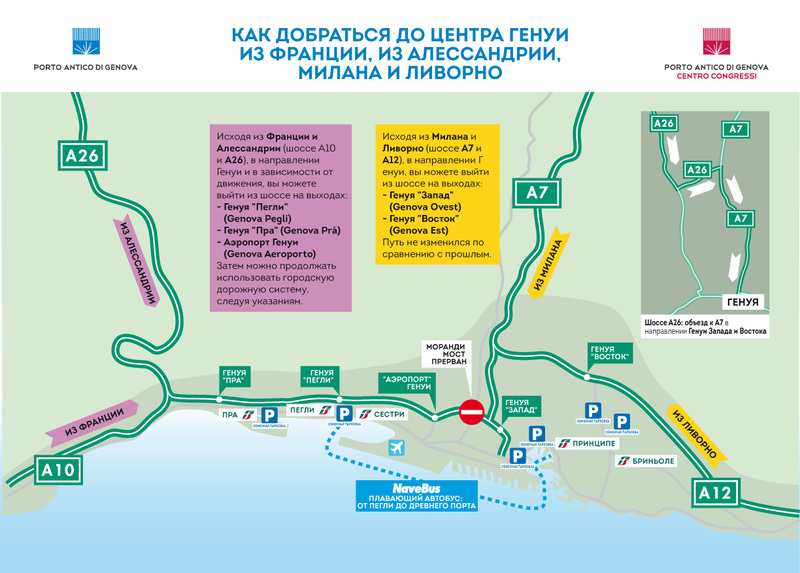 Here the map in Russian and French version. By bus no. 35 direction Via Vannucci, stop “Gramsci 2” / subway “Darsena” or bus no. 1 from Marittima / Principe Fs to last stop in Piazza Caricamento. Subway direction Brignole, stop “San Giorgio”. By bus with the “Volabus” (stop “Piazza De Ferrari” and continue on foot along Via San Lorenzo. Tickets cost € 6.00 and can be purchased on board. After changes in city driveability, a further shuttle service has been activated in addition to the ordinary service between the airport and the Genova Piazza Principe railway station. The service is available every day from 6:00 am to 8:00 pm with departure and arrival from the Arrivals Terminal. Boat Service (about 35 minutes) that connects Pegli (Molo Archetti – parking charges apply) with Porto Antico. Tickets cost € 3.00 and can be purchased on board.